The original was definitely an emulsified cream, but I’ve been playing with a really groovy new product from TKB Trading lately that made me decide to make my version an anhydrous oil serum. Said funky product is called Thickening Clay. 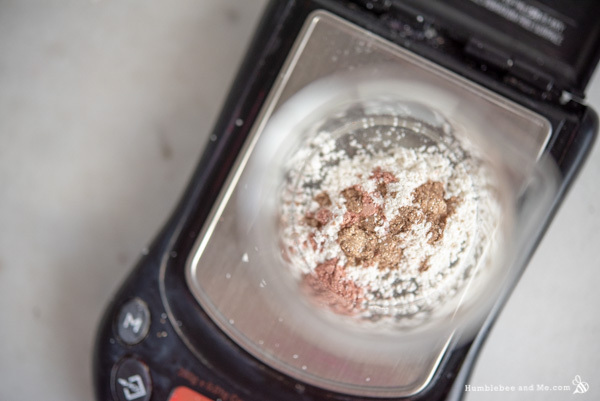 It’s a vegan clay-derived fine powder with an INCI of Quaternium-90 Sepiolite (and) Quaternium-90 Montmorillonite (learn more here). It looks like clay, but no other clay will work in place of Thickening Clay! 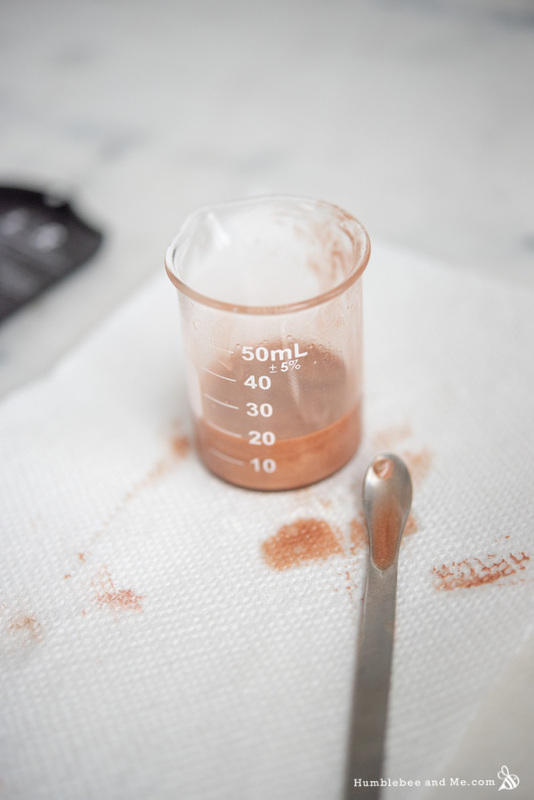 Thickening clay works to thicken oil based concoctions and keep pigments in suspension. 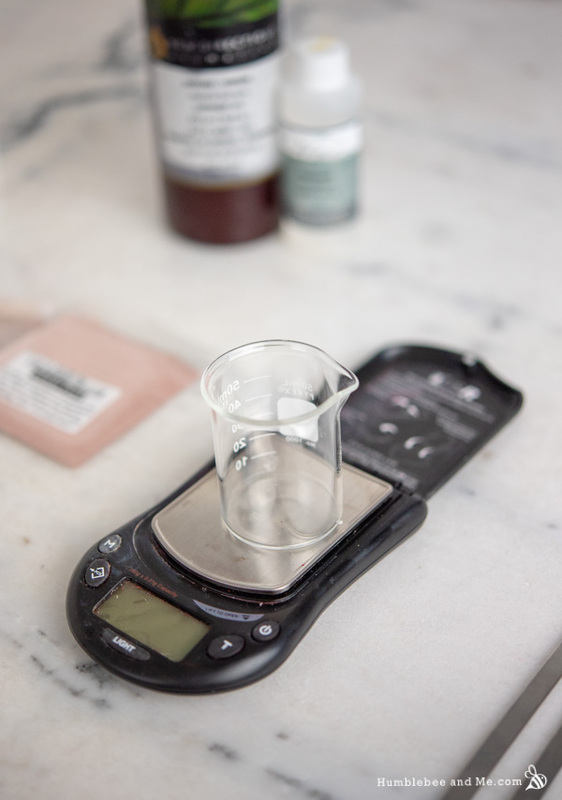 This means you won’t have to vigorously shake your concoction before every use to get the pigments back in play. Thickening clay also helps reduce the oiliness, helping the product lean towards a more matte finish (pssst… liquid lipsticks!). TKB recommends using it at 1–3%. I have found the higher end of that range can be drying, depending on the rest of the formula, so that’s something to keep in mind when you’re working with it. The level I’ve used it at doesn’t keep the micas in perfect suspension in perpetuity (I’ve found they’ll settle to about 90% of the depth of the liquid after a few days), but it does keep them from settling out solidly, and I didn’t want to use too much of the Thickening Clay and end up with a serum that was drying to the skin. Since this is a facial serum, the bulk of it is two lighter-weight oils my face loves: argan and squalane. You are certainly free to choose others if you wish, but I do recommend sticking to lighter oils for the finish we’re looking for. For some skin perfecting, I’ve included some sericite mica. This fantastic ingredient helps diffuse the appearance of light on the skin, giving a smooth, airbrushed appearance without coverage—it’ll help disguise the appearance of fine lines and pores, basically. Woo! I’ve also included a touch of mica for some glow and shimmer. I made a more sun-kissed version and a more pinky-pearl version. You’re welcome to customize the micas you use to something that will work brilliantly with your complexion! The making of is quite simple. 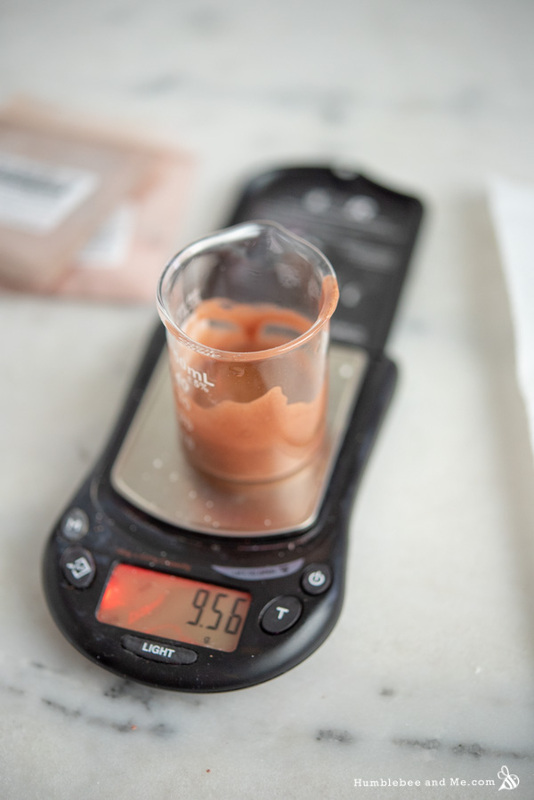 You’ll begin by stirring together all the powders, and then blend in a small amount of the liquid oils to create a smooth paste (similar to create a roux) before slowly blending in the remaining oils. And that’s it! You’ll be rewarded with a silky, shimmery liquid that leaves your complexion glowing. Swoon. 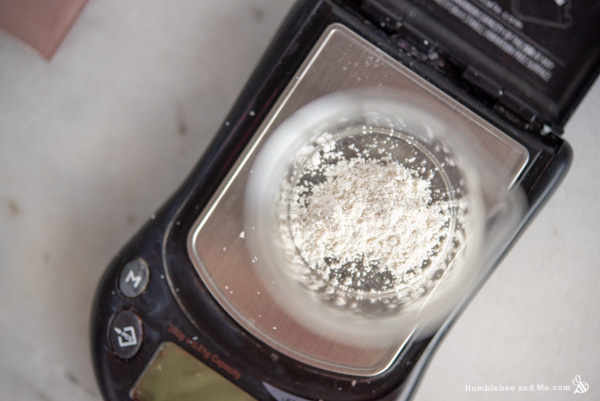 Weigh the powdered ingredients into a small bowl or beaker, and stir until thoroughly combine. Add 2g (13%) liquid oil and stir to create a smooth, uniform paste. Once you’ve got a smooth, shimmery paste, slowly stir in the rest of the liquid oils. That’s it! Pour into a 15mL/half ounce glass bottle with a dropper top. A clear bottle will really let the shimmer shine, but it’s certainly not necessary. The blog version used 0.1g artisan coral mica and 0.12g glimmer beige mica. The video version used 0.15g silver mica and 0.1g artisan coral mica. Because this serum is 100% oil based, it does not require a broad-spectrum preservative (broad spectrum preservatives ward off microbial growth, and microbes require water to live—no water, no microbes!). Kept reasonably cool and dry, it should last at least a year before any of the oils go rancid. If you notice it starts to smell like old nuts or crayons, that’s a sign that the oils have begun to oxidize; chuck it out and make a fresh batch if that happens. As I’ve provided this recipe in percentages as well as grams you can easily calculate it to any size using a simple spreadsheet as I’ve explained in this post. As written in grams this recipe will make 15g. Leave it out and replace with white kaolin clay. The micas will still settle but you’ll get a bit of that more matte finish the Thickening Clay gives. Replace it with TKB GelMaker CC; you’ll probably want to use the GelMaker around 6% for a similar effect, so I’d recommend removing 4% from the argan oil to make room for it. I can’t find any thickening clay in the UK, so will have to forego trying this one out 🙁 How is your new co-conditioner recipe going? Are you nearly ready to share Marie? I’m having the exact same problem Pauline 🙁 Which is shame as I used to love Spotlight! Perhaps one of our suppliers will catch on and start stocking one. Ah whoops! I forgot the substitutions section, d’oh—give it a read, you won’t have to miss out on this one 🙂 I’ve got the new CO drafted up and I’m planning on making it for the first time today with a beautiful new hydrosol—swoon! I will get some silica microspheres and try this with some Kaolin clay, as I can’t find gelmaker here either 🙁 Thank you Marie and I LOVE the new co-conditioner:-D Always look forward to reading my emails on Monday and Thursday, you really are a little gem. I have heard from a few people people that the comment notifications aren’t working terribly well—yet another thing for the ol’ to-do list, ha. Thanks so much for reading & DIYing with me! Using non-skin toned colors, would this product work as a color corrector? E.g. You may not want to be green, but you want to tone down the red in your complexion? Perhaps using a pigment rather than a mica? I will definitely suggest it to Michele! Thanks for the birthday wishes—I had a lovely time dressing up for the dinner party! Hi!!! I’ve the read the document you graciously linked for the thickening clay. Through all of the reading I’m still unclear. Is this product mixed with a synthetic ingredient to making the thickening clay what it is? I wouldn’t call it a “natural” product, but I also don’t really care that much about that sort of thing 🙂 Happy making! If I want to make it more opaque like a liquid highlighter, what can I add? 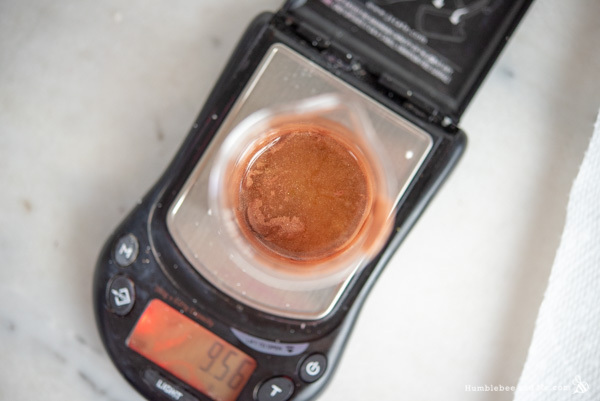 I believe a higher concentration of pigment would help give you some opacity as well as a base such a kaolin clay would help, but that would completely change the ratios and the end results. It’d be pretty though! Thanks for all your wonderful insights, blogs, and videos, Marie! Very well done! I haven’t had the greatest results with this method; I find the cetyl alcohol tends to precipitate out over time. It sort of works, and does feel nice though 🙂 So, basically—kind of, ha. 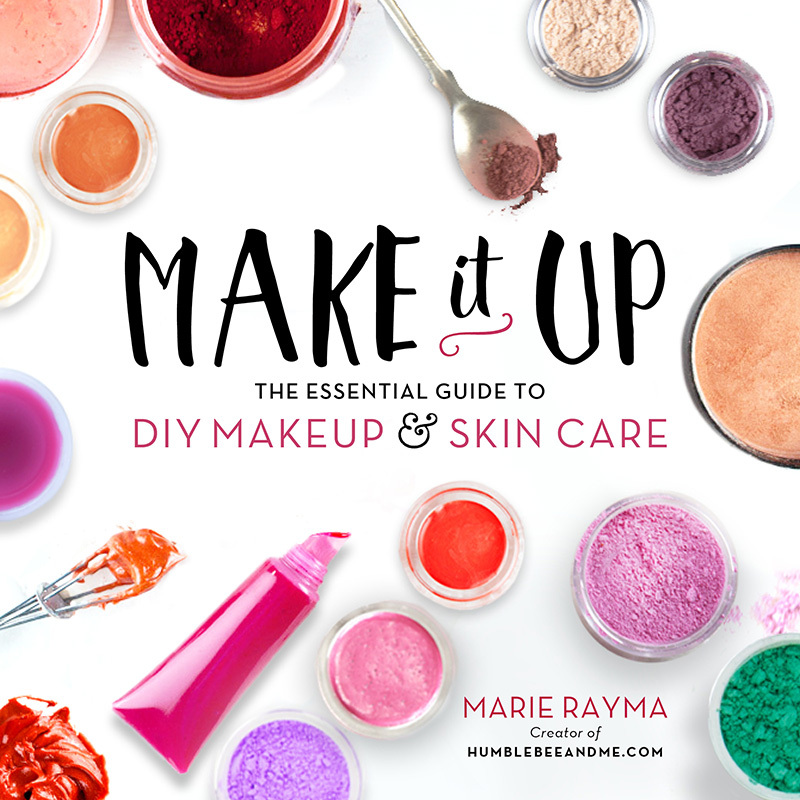 Hi Marie, I left a message on youtube about trying these ingredients in the liquid foundation in your book. I added silica microspheres, cericite premium mica, neossance squalane and left out the thickening clay. It turned out amazing, you gotta try this! Seriously gorgeous, skin perfecting, blurring effect, omg! I think we’re onto something here, lol! Just got my order from TKB trading and made this. Beautiful. With a dust of the airbrushing powder (from your amazing book!) I am ready to face the day. Re your amazing book is there a place we can go to if we have any questions about the recipes? It definitely needs a fan club or a Facebook group of like minded crazy people rhapsodising about the wonders of carmine and mica! This will be my first time using mica pigments in a serum. I am wondering…is there a pigment you can suggest that is neutral for a range of skin tones – say an ivory/pinkish, Caucasian/apricoty, and olive? I am hoping for a subtle glow, a bit of perfecting, and a dash of blur. Thanks for any and all suggestions. I generally like beigey ones—I’d recommend ordering a selection of samples from TKB Trading and seeing what you like. I’m really not great at broad recommendations for a wide variety of skin tones, sorry! No worries! I ended up using TKB’s ivory lace and oriental beige and they turned out lovely. Next time I may tick up the amount of sericite mica & thickening clay – just to play. Can I sell things made from your recipes?